I’d like to add that I’ve taken somewhat of a different approach this year when putting cars into consideration for the list. In the past, I really put a heavy emphasis on the builds being out for the world to see for an entire year’s time. Meaning that you really have to have a complete car from the beginning of the year until the end of the calendar year to really be considered for the list. While this makes sense, I feel that this puts some builds at a disadvantage because many regions and parts of the world just don’t have as many events as the West Coast does. 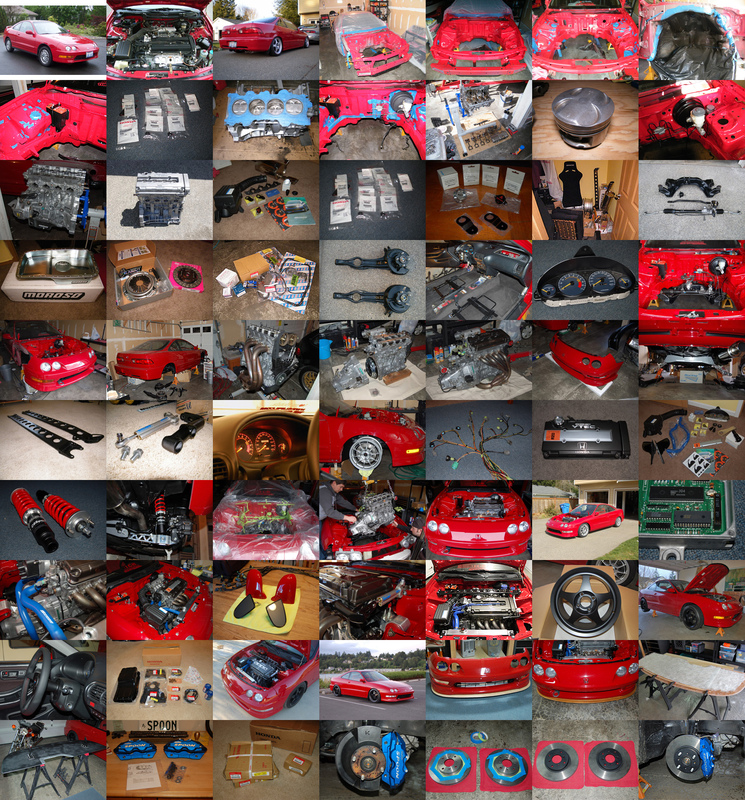 Without events, you’re relegated to only seeing the cars on the web and that is also an unfair way of judging the quality of a build because photos really alter reality at times. Instead of putting so much emphasis on the cars being complete and out for a whole year, I’ve been more liberal with the rule and have considered some cars that may not have been ready from the start of the year, and instead have taken other factors into consideration, like their impact on the community, and how much response they get from the build-up of their cars. It just doesn’t make sense to compare a build from, say, the West Coast, and somewhere like the Pacific Northwest or something because they never have events and their weather is so unpredictable that you are unlikely to see many of their builds throughout the season…. His build is very simplistic on the outside but it is the small details and the overall package which makes it great. He follows a traditional Spoon Sports theme religiously throughout the car and while I have never been a diehard Spoon guy, I appreciate it, especially on a Milano Red DC2. Red is far from anything that Spoon would ever have but Cooper’s car is his own interpretation on what a Spoon Integra would look like. To be honest, there isn’t anything “crazy” or overly unique about Cooper’s car…. …it makes the Top Ten list because of his efforts and how the car comes together as a package. It is completely, and utterly timeless. There isn’t anything on this car that would ever be considered “trendy” in any way. This car could be relevant in the 90s, 2000s, and beyond. If you want to build a personal Honda that you can enjoy and a car that you can bring out for a drive, this is how you would want to put it together. He purchased this car from a single owner in stock form and transformed it all on his own. You can tell that he knows what he is doing because he’s even made the drive back and forth from Washington to California multiple times in the past two years and has had zero issues with it mechanically…. The engine bay is about as clean as it gets without being shaved and overdone and it is a driver’s car, meaning that it is built to be enjoyed and driven, not just pulled out only for car shows and what not. Cooper also happens to have one of the most thorough build threads that I’ve ever seen. He hides nothing and holds no secrets from the rest of his fellow enthusiasts. He is helpful in providing knowledge and experience and you can really see how his car comes together from start to its current state. CLICK HERE to read all about it. Cooper was an easy selection for this list because both he and his Integra are great for the community…. 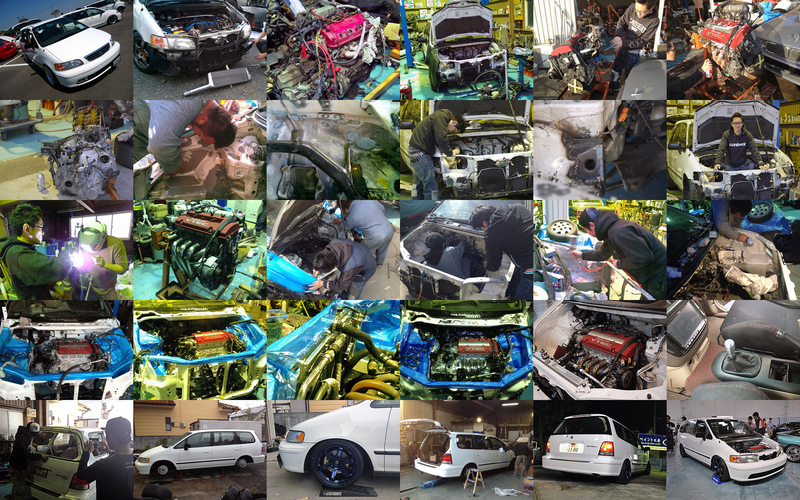 What made it such a popular build in 2013 was because of how “Japanese” it looked, if that makes sense to any of you. It carries with it a very Japanese Kanjo racer motif and with Kanjo Racing really catching steam over here in the U.S., it was almost the perfect time for Kyle’s EF to appear. I got to see it for myself at WEKEAST during the late summer and I too became a huge fan of the build. Like Cooper’s DC2, it does have that timeless look to it. The tire chalking is about the only thing that you would really consider anything remotely “trendy” about the build but it works with the overall look of the car because this is how a EF circuit build would look in Japan..
Of the three cars that ended-up tied for the tenth position here on the list, Jimmy’s would probably be the surprise selection…. I have long been intrigued by Jimmy’s CR-X because I think that it is a great example of another clean, everlasting Honda build. He just happens to have a little twist on it with an uncommon swap. That too just makes his project that much more enduring and unique. Again, there is nothing wild or infinitely unique about it, but it doesn’t need it. What he has created is a CR-X that many could strive to build towards without the car being overly ambitious and unattainable. I’ve have always been the type to enjoy the builds that really push the envelope but on the other end of the spectrum, we will always need builds like this CR-X as well. It is a reminder how how to build a clean Honda and the type of build that we all fell in love with when we first got our start building Hondas. The number 9 spot goes to two individuals from Japan who are instrumental in furthering the globalization of the USDM style/culture in the Land of the Rising Sun. Satoru Hasegawa’s Ferio build is honestly a bit of a mystery. While I remain constantly connected to the tuning community in Japan, Hasegawa’s car was a complete surprise to me when I first saw it in 2012. At that point, I had already considered it for the 2012 list because of how far ahead of its time (in relation to the Japanese Honda community) it was. It just narrowly missed the list because I hadn’t really seen or heard enough about it yet…. While it is nothing that would be thought of as “shocking” to us here in the U.S., it was an impactful build for the Japanese Honda community because there weren’t really any Hondas modified as thoroughly in this fashion yet in Japan. USDM culture has grown leaps and bounds within the last couple of years but Satoru’s Ferio got it down to a “t” without him ever having set foot in the U.S. to see the Hondas here for himself. The “stance” of the car may be a little overboard by many of our purists’ standards but in terms of carrying over the USDM style to Japan, it works. This type of fitment for Hondas is all the rage in Japan and Hasegawa’s is executed in this fashion because it is his interpretation of U.S. style…. His Ody is an important build for Japan because it not only showcases a tucked and shaved engine bay, it is also done on an platform where you would not normally see this type of work executed. To coincide with the custom engine bay is an H22A 5-speed swap, which is work in itself because Odysseys do not normally come with a 5-speed transmission so modifications had to be made to convert the car to manual transmission. This wouldn’t seem like it would be too hard on say, a Civic or Integra, but the Odyssey is originally a column-shift vehicle, so the layout is completely different than your typical car. Do accomplish this, the firewall had to be cut and a custom center console had to be created to house the shifter assembly that is mated to the H22 motor. Also interesting to note is the custom made air conditioning lines. Not only did they do a H-swap, they also managed to keep the car with functioning air conditioning and did it in a way where it wouldn’t be an eyesore…. Xavier’s Civic is an interesting choice for me personally. While I’ve always liked his build, I think his bravado is a little much. I’ll be the first one to tell you that I think that he is his own biggest fan but the different types of personalities that I encounter in our community is what ultimately makes what we do unique…. With such a tight race between so many great cars, it is the detail touches that really matter. Stuff like this brake ducting that runs from the Mugen SS front into the J’s Racing big brakes are what make Josh’s S2000 so cool. You wouldn’t even see this normally because it is covered but detail is essential in developing a Top Ten Honda…. 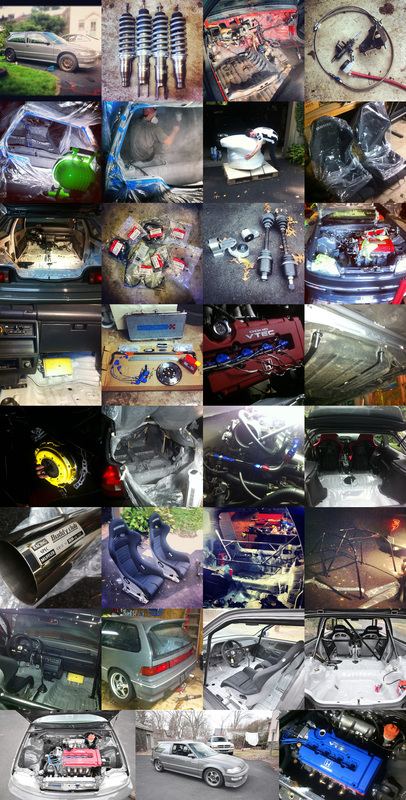 To see more of Josh aka MugenAP2’s build, check out his build thread HERE…. Like the other Integra owner on this list, Cooper Boudia, Chen also happens to have one of the most thorough build threads I have ever seen. 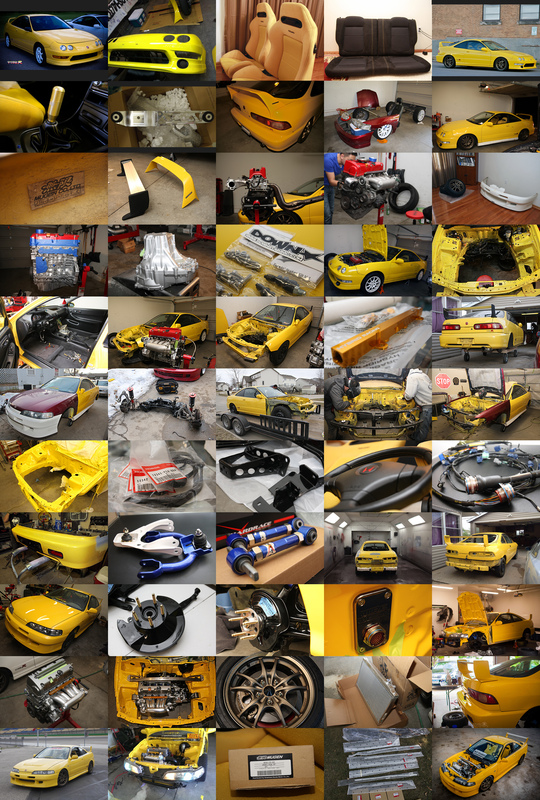 In it, you really get a great grasp of the amount of work that went into transforming his bone stock Phoenix Yellow ITR into a complete Mugen R. I was incredibly impressed by how quickly the car came together and how he was actually able to source a complete Mugen aero kit. The engine bay was also cleaned-up, re-sprayed in PY, and K-swapped. 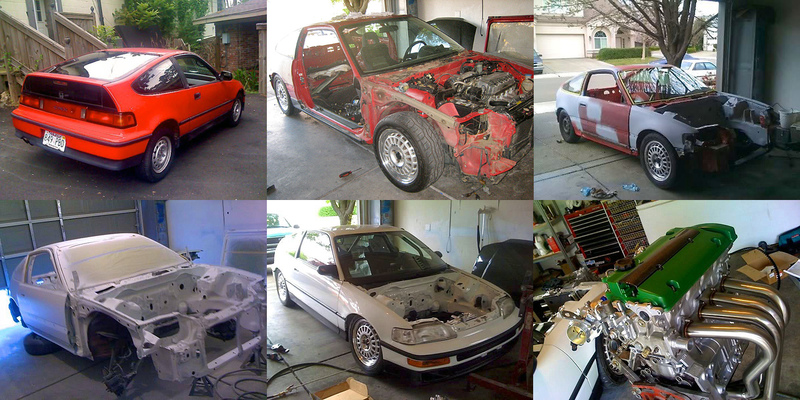 His build resembled a complete resto-mod project but the ITR didn’t have to be stripped down completely. Various parts on the car were just cleaned-up and refreshed just because Huang felt it was necessary. He actually had a nice EDM-themed build going as well before he ultimately switched over to a JDM front end with full Mugen kit. Kyle (#10 EF) isn’t actually using the J’s/Crux suspension; they’ve been for sale since they bought them. There is also no chance they’d go that low on any EF chassis. <- Old owner of the aforementioned J's/Crux suspension. Woot woot! Midwest is representing! Nice work, Chen Huang. That is dedication to stay true! The PY Mugen ITR is amazing, as is the Mugen S2k. The rest are great choices as well. Can anyone tell me what intake Satoru Hasegawa is running on that Ferio? i hate Ties, it makes life so much harder. hahaha, i love cooper’s DC build, a lot of nice cars come out of the PNW, and this is one of the prime examples of that.